Jaundice is a condition marked by a yellowish color to the skin and the whites of the eyes. Jaundice is a sign of hyperbilirubinemia a high level of bilirubin (a substance that comes from the natural breakdown of the heme portion of hemoglobin) in the body. Typical causes are excessive breakdown of red blood cells or a hepatic (liver) dysfunction. Excessively high levels of bilirubin are harmful and can cause brain damage, but the cause of the jaundice is usually a larger problem. There are many underlying causes for jaundice, so treatments may vary. Typical causes include hepatitis, obstructive jaundice (blockage of the bile ducts of the liver, perhaps by gallstones), or cirrhosis of the liver (often caused by chronic drinking, but not always). People with Gilbert's Syndrome may suffer occasional bouts of jaundice, but this is a benign condition that does not require treatment; see Further Reading below for more information. More than half of newborn infants experience neonatal jaundice, a condition that usually clears up on its own as the baby's liver function develops in the first few days of life. One effective treatment for neonatal (newborn infant) hyperbilirubinemiais (jaundice) is called phototherapy, where the patient is put under special fluorescent lamps to help break down the excess bilirubin. This can be done at home with supervision or on an outpatient basis. Jaundice is a general symptom of impaired liver function. Certain chemicals can affect liver function. Be sure to study the health risks on your MSDS and minimize your exposure to such agents using engineering controls (such as fume hoods and ventilation) as well as proper personal protective equipment (gloves, goggles, respirators etc.). 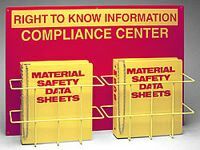 All employees have a Right To Know about the hazards in their workplace. Ensure legal compliance with RTK centers and more from Safety Emporium. Jaundice at the Merck manual has an excellent technical article that begins with a discussion of bilirubin metabolism. Jaundice - Yellow Skin at the NIH's Medline Plus. Gilbert's Syndrome causes jaundice but does not require treatment. Jaundice In Healthy Newborns at KidsHealth.org. Jaundice in Newborns at Yahoo! Health. The American Liver Foundation for info about all liver disorders.